So, like suggested in question, I am extremely confused about this one concept. That whether or not the injection of foreign antibodies ( passive artificial immunity ) triggers an immune response. From what I have learnt, the general idea is that the antibodies injected into humans, which may have been extracted from another animal or synthesized artificially using hybridoma cells, act as foreign antigens to the body and trigger the cells of the immune system such as neutrophils to engulf and destroy these antibodies and anything they are binded to it ( bacteria or viruses ). "Two people took part in a study to find out the effectiveness of two types of immunization. Person A received an injection of antibodies against tetanus and person B received a tetanus vaccination. (I) decreased during the study period, (II) did not increase. " 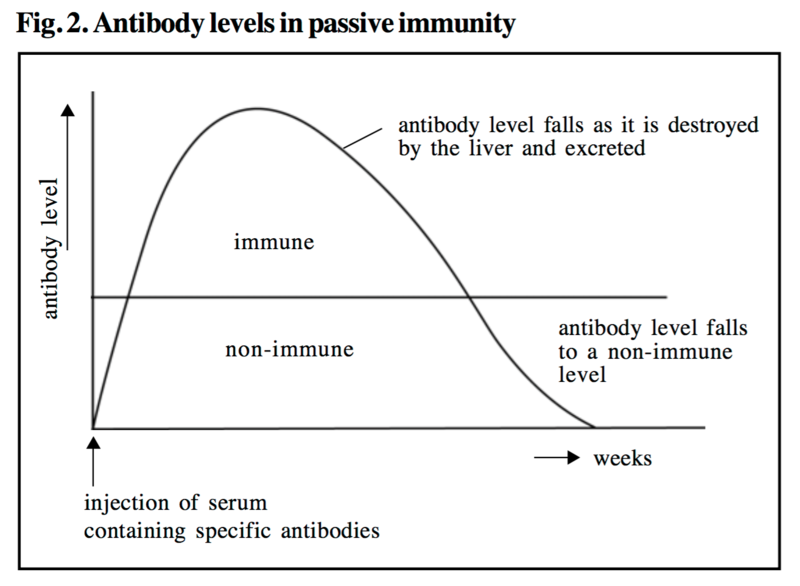 The graph provided is similar to that shown in https://i.stack.imgur.com/obZ8V.png except that the rise is not seen (instantaneous) and that the x axis is in days, and most IMPORTANTLY the graph depicts concentration of antibodies to tetanus (as injected earlier). (II) no antigen entered body; no immune response; no (active) B Cells/plasma cells/memory cells; no antibody made; "
Now, the reason I don't understand this is because it doesn't quite align with what I have learnt. Wouldn't a foreign antibody trigger an immune response causing the neutrophils to engulf and break the antibody down. And wouldn't the reasoning for it not increasing be that it is simply an antibody that cannot produce copies of itself as it lacks the machinery and only injection was provided, followed by its removal by the immune system? Even lets suppose if there was an immune response, why would the concentration of TETANUS antibodies, which were injected, increase? This is on an AS (Advanced Subsidiary Level) for CAIE. Please, if someone can explain this concept and the answer suggested by the marking scheme, I will be extremely grateful. Browse other questions tagged immunology immune-system or ask your own question.